A jealous rivalry between three high school girls leads to a shocking crime. I am a big fan of Josie Davis. At first when I saw her do The Perfect Assistant, I didn't like her. But then I saw it again and I realized I didn't like her character she played. And that is a true tribute to this wonderful actress's talents. 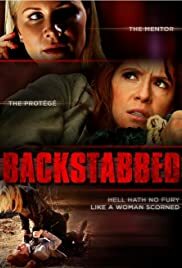 I recently saw two of Miss Davis LMN films, Accidental Obsession and Backstabbed. Completely different films and roles. In one she is the victim and the other she was the evil one. She is that versatile in what she does. Brilliant in all the small looks and reactions that maybe you miss but, as an actor myself, I see all the work she puts into her performances. Even when the scripts aren't the best, she stands out in them all. Check her out in Dirty Teacher. I just wish she could get into the big time films and get to work with the best in the business. I wish her so much ahead of her.